Julie Bishop's "eye-catching, blue sparkly dress". Source: Daily Tele. “Back in Black”! Fawningly, The Australian newspaper cut and pasted the Liberal Party press release. The Fin Review ran its predictable “Cash Splash” narrative. 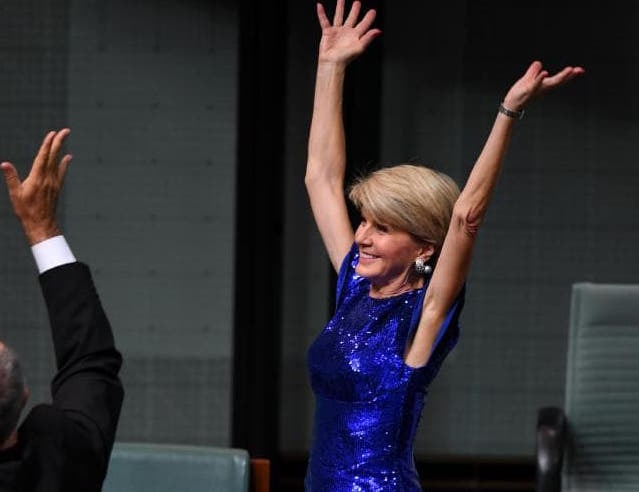 Nine Network’s Sydney Morning Herald splashed “$20 billion tax cuts is good news for voters” and the Daily Tele led with Julie Bishop’s “eye-catching, blue sparkly dress that was more disco than deficit”. It would always be the case that the Murdoch tabloids and the lately conservative Nine/Fairfax media would be lavish in their praise and the New Daily and Guardian Australia would be critical. What the entire media seems to have missed however is the artful double-counting which has ramped up the magnitude of the Budget tax cuts, in some cases, by a factor of five. The Treasurer’s trick was to inveigle the press into counting the tax cuts in last year’s Budget in their numbers for this year’s Budget, a ruse which inflated tax cuts for low income earners by a factor of five and medium income earners by a factor of two. It wasn’t just “The Government Gazette”, as The Australian has been fondly monikered, running the official PR. Everybody bought it. Peter Van Onselen was telling Fran Kelly on ABC Radio this morning how the number for low income earners was $255 (as per the first line in the table above). In fact, you only get to $255 if you include the numbers from last year’s Budget. The actual number from this budget is just $55. Last week, we predicted here that PM Scott Morrison and his treasurer Josh Frydenberg would fiddle with the tax brackets to deliver a big tax relief story for their Election Budget. We also revealed that there were not really four tax brackets but really 11. As anticipated in this story, it was a busy night for the hitherto reclusive LAMITO (Low And Middle Income Tax Offset) offset. This is the “reclusive offset” which sits quietly in the mix tweaking the four well known tax brackets. It’s largely ignored, and not well known. But not this budget night. It is the only thing that has changed. And only if the Budget can pass both Houses of Parliament before an election is called. Bear in mind, your marginal rate is the tax take on your next dollar. before this budget (today), LAMITO fades in from $37,000 to $48,000, sits at $530 till $90,000 and then fades away to zero by $125,333. after this budget (if enacted), LAMITO provides $55 flat up to $37,000 (that’s new), fades in from $37,000 to $48,000, sits at $1080 (only $550 of that is new) till $90,000 and then fades away to zero by $126,000. LAMITO covers all that the LITO (Low Income Tax Offset) covers. Plus it extends the benefits to higher incomes. Everybody likes offsets. 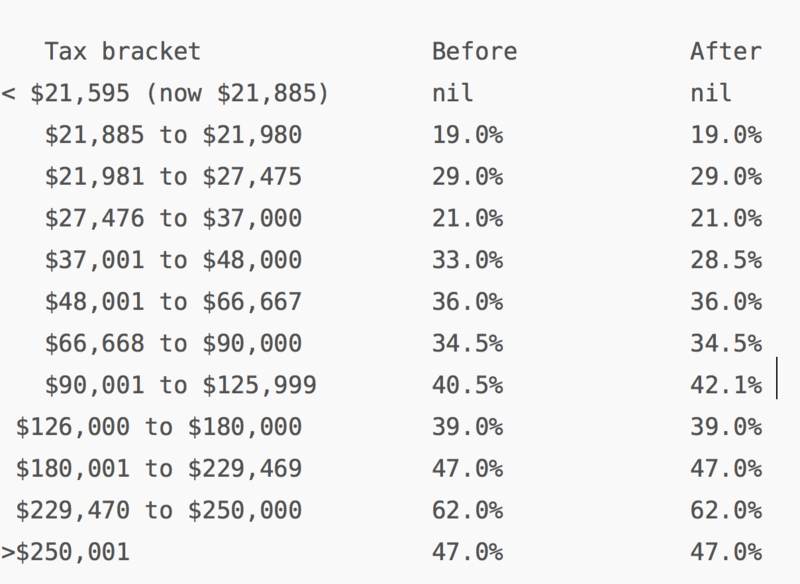 “Offsets” are good news: the bigger an offset gets, the larger the reduction in tax you get. 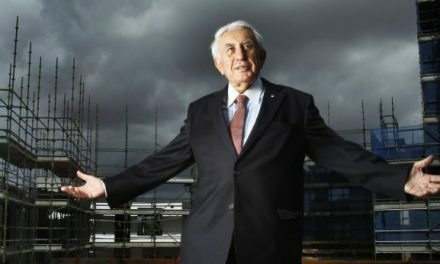 Like all offsets – indeed like the controversial franking credits offset – LAMITO is a “tax reducer”. There’s a budget handout called “Lower Taxes – Budget relief to encourage and reward hard-working Australians”. Pages 6 and 10 provide a guide to the LAMITO changes. Unfortunately, however, where page 6 proclaims a $255 benefit for low income earners, it’s only $55 from this budget. The rest is existing law. And where page 6 proclaims a $1080 benefit for medium income earners, it’s actually only $550 that is new – $530 is existing law. The table on page 10 shows how the claimed effect comes from two budgets, combined. The table of “cameos” on page 29 is a little mischievous; again, suggesting a $255 benefit. A closer look at that table shows that the numbers are based on the 2018 budget – the last budget, not this one. What is the justification for this double-count? Maybe the offset tweak is designed to take immediate effect (if enacted before the election is called). There’s not much time. If enacted, but only then, will the benefits flow. And then only by lodging this year’s tax return. Significantly, despite a tweak to the bottom end, Medicare’s brutal fade-in keeps its short sharp kick for those in the lower brackets, staying at 29 per cent marginal. 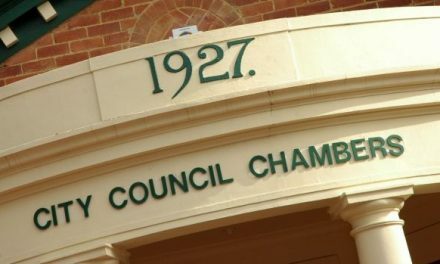 And the super contributions surcharge did nothing to, or for, top-end salary earners either, staying at 62 per cent marginal. 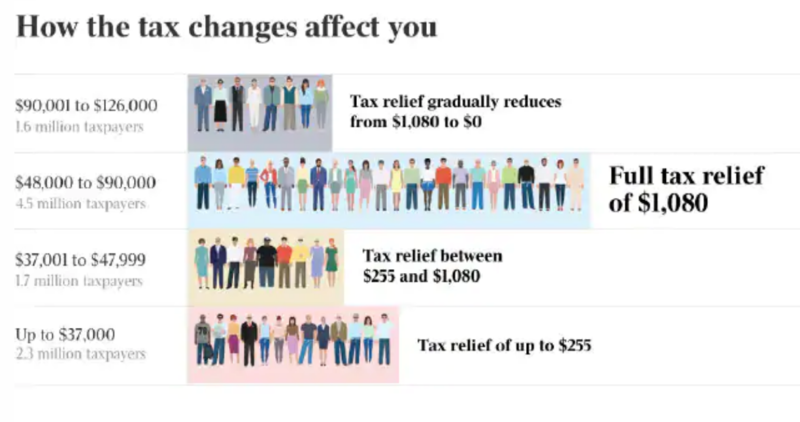 In pollie-speak it means: as you earn more, your tax rate increases; the extra dollar earned is taxed at a higher rate than the last one. Obviously, it sounds like a bad thing. That’s if you ignore the favourable steps down; the marginal rate reductions! They’re now at: $27,476, $66,668, and $126,000. If you are chasing a wage rise, that’s where you pitch it. And, as you add all the offsets together, small business people get it too. But this is all quite academic as, despite the effusive press coverage, a budget is not a budget until it gets through Parliament and with only a few sitting days left, probably, the Government is out of time. Further to reasonable conjecture, Scott Morrison no doubt ordered up two things: a big surplus number for its Back in Black narrative and as much in the way of electoral bribes (tax cuts) as his troops could possibly muster. So Josh Frydenberg and Mathias Cormann duly delivered billions from the NDIS and all the right estimates for Back in Black, as well as billions in tax cuts amped up by double counting last year’s Budget. It will be interesting to see when the mainstream media pick it up, or whether they pick it up at all. In view of the gushing coverage so far, and the fact it is all never likely to happen anyway, this has been an absolutely first-class PR blitz by Scott Morrison and co.
PreviousFranking Credits: why no government payment for bank interest?